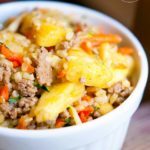 This clean eating curry pineapple turkey rice bowl offers a lovely sweet and savory flavor to your dinner table! A wonderful source of protein, manganese and niacin, this delicious dish is the perfect way to get your family around the dinner table. This was a recipe that was cut from my second cookbook. We just ran out of room! But it’s delicious and clean. My favorite combination! It’s filling too, and because it involves pineapple, most younger family members will enjoy it too. Give it a try! This delicious dish has a sweet/savory flavor you'll enjoy again and again! Place the turkey in a large skillet with olive oil and cook with spices and pineapple juice (not the pineapple. Strain off the juice for cooking). 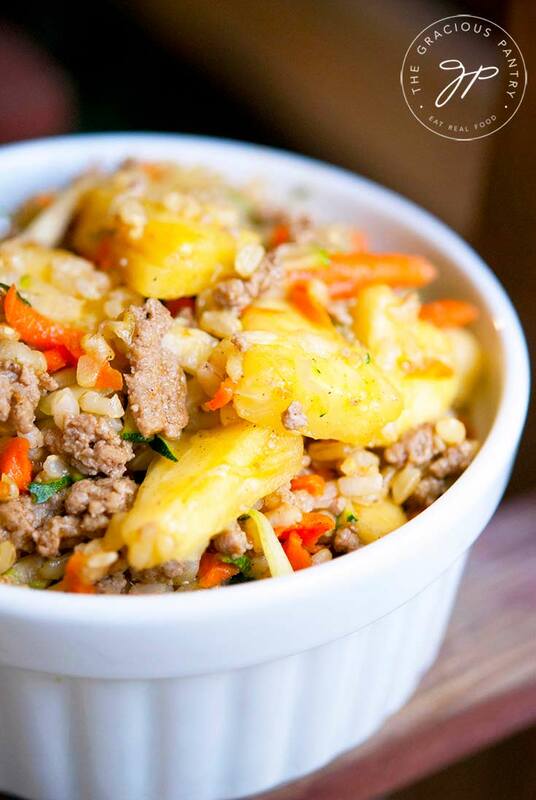 While the meat cooks, mix the cooked rice, carrots and zucchini in a large mixing bowl. When the meat is done mix that in along with the pineapple and serve. This recipe from the Gracious Pantry archives, originally posted 8/29/12. Yup, exactly. Just portion it out into whatever individual portions you want and stick it in the freezer, pineapple and all. Try mixing 1/2 white and 1/2 brown rice. It’s a good middle ground and gives you a little extra nutrition. Enjoy! About that much, yes. And about 1/2 – 3/4 cups juice, depending on the can. do yo think I could use whole turkey (thanksgiving leftovers) instead of ground turkey? You can try it. It would definitely come out different, but that doesn’t mean it wouldn’t be good. In a pot or in the microwave. However you usually heat things up. If you are new to clean eating, it will take a while for your taste buds to adjust. I’d be willing to bet that if you eat clean for about 2 months and then try this recipe again, you’ll enjoy it far more. As our palate adjusts, we start to notice more subtle flavors and we don’t need as much spice or salt. Give it time. And welcome to my blog! Jamie – what do you mean by “juice from the ground turkey”? How would you recommend freezing and reheating this? I would like to make this as a freezer meal for when baby arrives but I’m not sure how. Lauren – You can just make it and freeze it in portioned sizes. It should freeze pretty well. We loved this recipe! I doubled it but was a bit uncertain about the cooking time. How long do you cook the turkey with the spices and juice? Thanks! Niessa – I just cooked it until the meat was cooked through. If you double the recipe, it will take longer. I’m going to guess between 20 and 30 minutes, but it could be a little longer too.